"I have to say that 1952 was the worst year of my life. I met some nice buddies and had some good times, but overall it was not a time in my life that I looked back to with fond memories. "I finished 16 weeks of advanced medical training at Ft. Sam Houston, Texas and was promptly dispatched to Korea. I wound up at the 3rd Bn 15 Rgt medical aid station. I lasted 2 weeks and then left for Love Company as a rifleman. L Co was on the MLR and I was not a happy camper. "We had the usual probes, patrols, and mortar attacks until we went into reserve. My memory is very bad, but certain things I will never forget. The main one is the early August patrol when we were ambushed and I lost my buddy, Truman Moen. "Moen's squad was leading the company patrol when we were ambushed. As soon as the shooting stopped, I went to find him. I found him and he had been hit with small arms fire. He looked at me and said something which I could not make out and then died. I laid him on my poncho and dragged his body back to the Outpost. "Truman was a good American kid who would say, 'I just want to get through this year and go home'. "In Sep 52, I received some good news. I was being transferred to the 3rd Infantry Medical Corps and going back to the medical headquarters. The bad news was that I was being assigned right back to Love Co as an aid man. 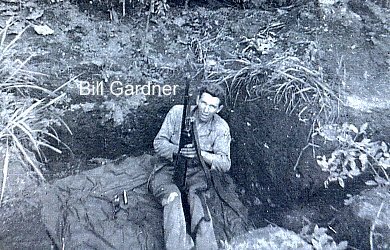 The only difference was that I had traded my M1 Garand for an aid bag and an M1 Carbine. I made it through and was discharged in Feb 53. In my civilian life, I forgot Korea completely. That's why I can't remember things that well. I thought it was better to forget and start living life as it was meant to be lived. Don." 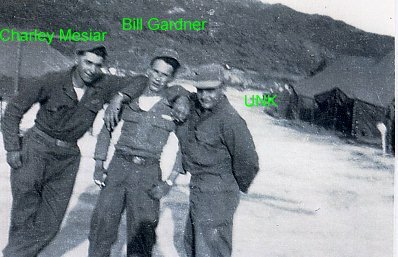 I told Don that I didn't know ANY happy campers in Korea and that Don's view about his Korean experiences, after he made it home, were much the same as mine and, I suspect, much the same as nearly all of the guys in our Bunker. It was only after drifting into starting the IBB (about forty-eight years after Korea) that I began to relive those days and wanting to learn more about where the hell I had been and what the hell had happened on those particular hills before, while, and after I was there. Thanks much, Don, for holding on to your old, precious photos. Would that the claws of the tropics had not gathered mine. 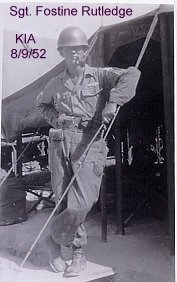 "Truman Moen was a quiet, gentle GI who, unfortunately, was killed in the ambush of 8 Aug 1952." I have learned from others enough to know that, when Don made the above drawing, Love Co was located on the MLR to the west of Baker Co, which had Kelly as its main outpost. Kelly was located just out of the drawing to the right of Breadloaf. To the east of Baker Co and and along the MLR to where it crossed the Imjin River was Charlie Co, which had Tessie as its main outpost. Able Co was on the MLR from where it crossed the Imjin and then ran along the Imjin as far as Outpost Nori, just across the river. Hill 317, Breadloaf, Kelly, and (of course) Nori were all clearly visible from the Able Co area. 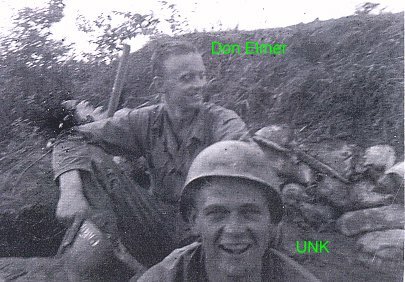 I can tell on my own that the drawing to your left was made by Don while he was in the eastern part of the March 1952 Able Company spot on the Imjin. Don's drawing is much prettier and more accurate than is my Corporal Key's Map. I have inserted (here and there below) links to the Bunker entries of the men who are pictured and have also jumped in our Bunker. I also have also inserted all the entries I could find in the 3rd Division casualty lists for the pictured men. 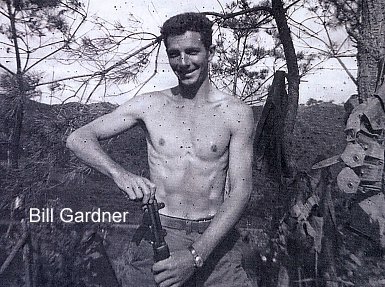 Dan Wolfe (#69) talks about Bill Gardner on the IBB page L on the Imjin. 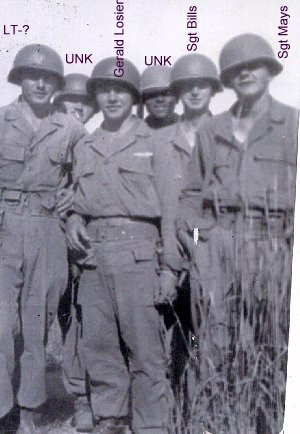 Dan Wolfe (#69) has remembered Sergeant Rutledge and talked of the circumstances off his death on the IBB photo page L on the Imjin. Everyone is welcome to identify the "UNK" men in all of these photos. When it happens, I'll make an add-on here to get the good news out. If any more of the men in these photos make an entry into our Bunker, or have an entry made for them, someone please remind me to link to it on this page. Thanks. 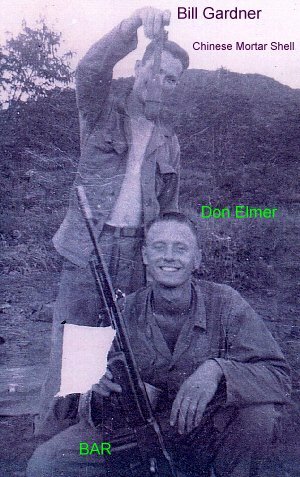 Dan Wolfe (#59) also has furnished photos of Co L men, including another of Sgt Fostine Rutledge, on the page The Men in Love.